A jewel of a knife. Engraving by Italian Master Engraver, Melo Rinniui, who is best known for engraving guns that sell for $100,000 and more. 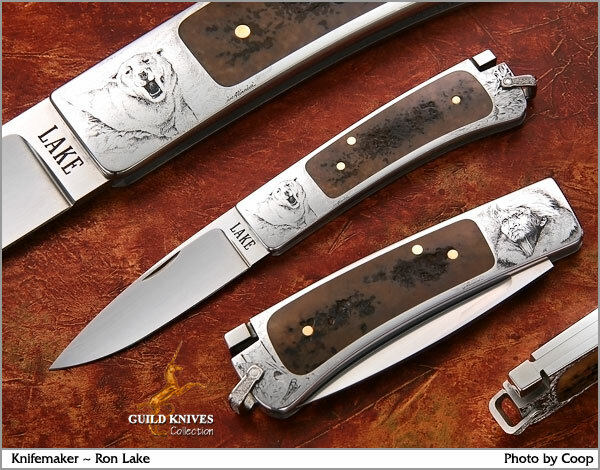 Ron Lake makes around 20 knives a year. A careful look at this knife brings out the extraordinarily subtle detail of Rinniuiâ€™s Bulino Engraving of a Polar Bear and Eskimo Hunter on the frame, and also an igloo, dogsled, and icebergs. Engraved lanyard loop. This interframe of rich Cafe Au Lait colored Mastodon Ivory is knock-out fabulous. Truly investment quality.